First of all, this is our very first blog post – very exciting! We’re so happy that you have stopped by our travel blog to read about our various adventures. We are Justin and Lauren, and feel free to check out the about us page if you’d like to learn more about who we are! 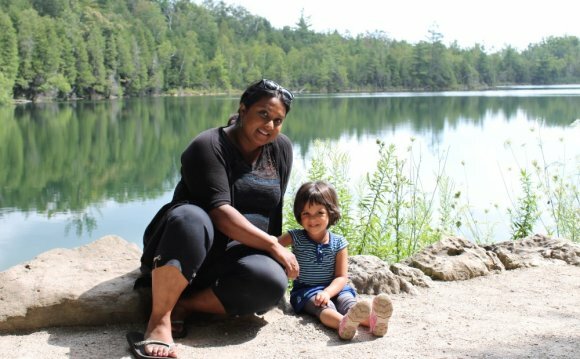 Last week, we went for one of our first Spring hikes of 2013 to Crawford Lake in Campbellville (Milton), Ontario. 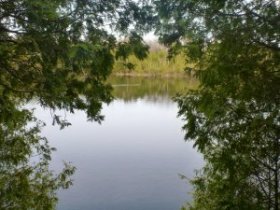 Crawford Lake is one of six Conservation Halton Parks in the Milton/Burlington region of southern Ontario. 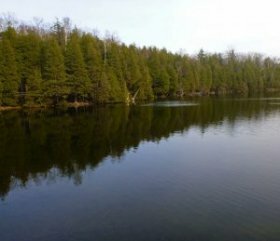 Crawford Lake is a rare meromictic lake with a boardwalk that completely surrounds the lake. 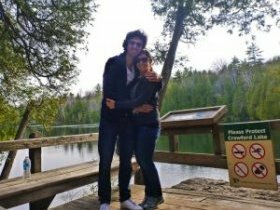 This made it possible for us to easily walk around the entire perimeter of the lake while still enjoying the natural forest surroundings. 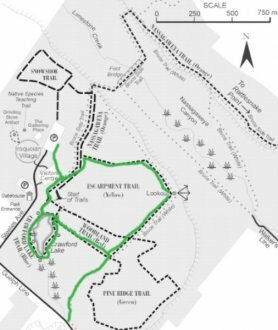 Here is a map of where we walked, as shown in the green color. We started at the parking lot and walked past the Visitor’s Center, down to Crawford Lake. We walked along the boardwalk encircling the entire lake. From there, we walked down the Woodland Trail (Red markers) and veered right down a section of the Bruce Trail. We walked south until we reached a main road (Guelph Line). So, we turned around and went back the way we came. We continued along the Bruce Trail down the Escarpment Trail (Yellow markers) towards the Lookout. Then, we completed the Escarpment Trail loop back to where we started. We are setting a goal to eventually hike the entire Bruce Trail from Niagara to Tobermory (almost 800km in length!). We didn’t originally plan to start our Bruce Trail hike that day, but it just so happened that part of the Bruce Trail was at Crawford Lake. So, we’ll be including this walk in our hiking logs! 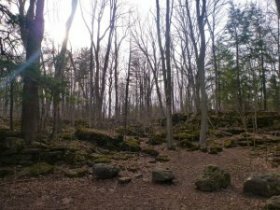 I’m sure we will eventually be back in this neck of the woods, but it is nice that we hiked a very small portion of the Bruce Trail that day. It was one small part of the journey that will help us reach our goal! More will be written about the Bruce Trail in future blog posts. It was a beautiful day outside with the ideal weather for a long walk. We were able to hike comfortably in jeans and sweaters without feeling too warm. It felt great to be away from the city and walking around in the sunshine. The lake view was lovely and we were able to take in the scenery while walking around the whole lake. There were various lookout points all around with informative signs posted about the lake itself and the creatures living around the area. 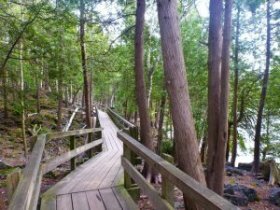 The wooden boardwalk makes the lake very accessible for anyone to go on a hike in the forest. From the lake, we walked off the boardwalk and down a dirt path called the Woodland Trail. 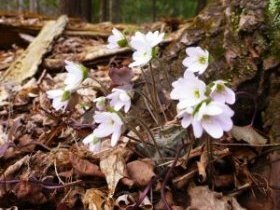 We noticed some tiny flowers growing up from the soil – surely, one of the first signs of Spring! We were amongst the only people hiking the trails that afternoon, despite it being a beautiful day. We saw maybe two or three other people walking their dogs. The path felt like our own place shared between us, the forest, and some of the wildlife living there! Once we walked along parts of the Woodland Trail, we continued along the Bruce Trail / Escarpment Trail to the lookout point. This was a view overlooking the escarpment and the valley below. There were tons of turkey vultures flying all around since they lay their nests in the rocky walls of the escarpment below. It was so amazing to see these huge vultures up so close! The hike continued along the escarpment edge for a while, with many impressive views throughout the walk. At one point, we stopped in our tracks because we heard a commotion – there were several turkey vultures up in the trees right where we were walking! One brave turkey vulture stayed behind and you can see him in the photo posted above. Speaking of animals, we also saw some squirrels, one raccoon, and our favorite of the hike – a small family of deer. As we were walking along the rocky Escarpment Trail, Justin spotted one deer and we immediately stopped and tried to stay as quiet as possible. Another deer emerged alongside the first deer, and we were able to watch them for a short while. The deer slowly retreated back into the forest, and met with a third deer that was hanging out a bit behind the others. All three animals were so beautiful – the sight of them was breathtaking! It was so awesome to be able to watch the deer so closely, and it made our hike even more magical!